The Giants have agreed to a deal with running back Shaun Draughn, agent Sean Stellato tells Adam Schefter of ESPN.com (on Twitter). Terms of the deal are not yet known. Last year, Draughn re-upped with the 49ers on an inexpensive one-year deal. Draughn, 29, appeared in all 16 games for the Niners last year, mainly in a reserve role. He ran for 196 yards off of 74 carries and found the end zone four times. He also added 29 catches for 263 yards and two touchdowns. The Giants are currently slated to start rising sophomore Paul Perkins with Shane Vereen, Orleans Darkwa, and George Winn in support. The G-Men have been expected to explore running back upgrades and the Draughn signing probably won’t stop them from continuing that search. This year’s draft has a number of talented running backs (especially at the top) and there are a handful of big name backs left in free agency, including Adrian Peterson, LeGarrette Blount, and Jamaal Charles. Draughn’s defection will leave the 49ers searching for a new reserve to put behind starter Carlos Hyde. The Niners recently had Tim Hightower in for a visit and he could be a candidate for the role. Mike Davis and Raheem Mostert are also under contract. The Giants are now slated to be the seventh NFL team of Draughn’s career. In addition to the Niners, the running back has previously suited up for the Chiefs, Ravens, Chargers, Browns, and Bears. The 49ers have reached an agreement with running back Shaun Draughn on a one-year contract, agent Sean Stellato tells Adam Schefter of ESPN.com (Twitter link). The deal comes less than a week after new Niners head coach Chip Kelly said he’d like to re-sign Draughn. Draughn, 28, started the season with the Browns and finished it on the 49ers’ injured reserve list. In between though, he acted as San Francisco’s feature back for six games when Carlos Hyde was injured. In those six contests, Draughn ran for 263 yards and a touchdown on 76 carries, adding another 175 yards through the air on 25 catches. Draughn had been eligible for restricted free agency, so the one-year deal with the 49ers makes sense. The short-term pact will allow the running back to become eligible for unrestricted free agency next winter. While the financial terms of Draughn’s new contract aren’t yet known, a number to keep in mind is $1.671MM — that’s the value of this year’s low-end RFA tender, which the team would have had to assign to the North Carolina product before next Wednesday to keep him from becoming an unrestricted free agent. We’ll have to wait to see how the value of Draughn’s one-year pact compares to that figure. Seahawks defensive end Michael Bennett and Chiefs running back Spencer Ware have both hired Relativity Sports for representation, according to Liz Mullen of SportsBusiness Journal (Twitter links). Ware isn’t even eligible for restricted free agency until 2017, so Bennett is the more notable name here, since the standout pass rusher wants Seattle to rework his deal. As Gregg Bell of The News Tribune details (via Twitter), head coach Pete Carroll said today that he has spoken to Bennett about his situation, though it’s probably on the back-burner for now. Unless the Seahawks feel they could rework Bennett’s contract in a way that would create some cap space for free agency, the team likely won’t address it until the spring. In addition to discussing Kaepernick, Kelly also said he’d like the 49ers to re-sign running back Shaun Draughn (Twitter link), and refuted the assumption that fullback Bruce Miller will be let go because he won’t have a role in Kelly’s offense. According to GM Tom Telesco, the Chargers‘ tight end position is “in flux” (Twitter link via Michael Gehlken of U-T San Diego). Both Antonio Gates and Ladarius Green are among San Diego’s free agents and Telesco said he’ll meet with their agents at the combine this week. Telesco also said today that the Chargers‘ wide receiver depth is “not as strong with Malcom [Floyd] not being there” (Twitter link via Gehlken). Needless to say, San Diego is firmly in the market for more help at the position, and is hunting specifically for a deep threat. The 49ers rallied back from a 24-0 deficit against the Bengals to make it look respectable, but they got beaten pretty bad to fall to 4-10 on the season, clinching last place in the NFC West. Without much to root for in San Francisco, here are a few storylines to follow as we come to the final two weeks of the season. 49ers defensive lineman Tank Carradine isn’t known as an edge rusher, but he has been remaking his body in order to be more of an explosive pass rusher from the outside, according to CSNBayArea.com. Carradine is currently at 295 pounds, but hopes to eventually play at his more natural weight of 260 or 265 pounds. He is in a contract year next season, and wants to make an impact as a pass rushing defensive end or outside linebacker. The 49ers might be in need of some running back depth with Shaun Draughn dealing with an injury. Fortunately, Mike Davis is eligible to return from IR-DTR this week, according to Matt Barrows of the Sacramento Bee (via Twitter). While the majority of the team’s fans are likely looking ahead to 2016, 49ers CEO Jed York won’t talk about any potential changes until after the season, according to Matt Maiocco of CSNBayArea.com (via Twitter). David Fucillo of NinersNation.com hopes that the conversation York has after the season includes drastic changes across the coaching staff. While Albert should be fine after suffering a knee injury during the loss in San Diego, Dolphins center Mike Pouncey wasn’t so lucky. He left the game with his foot stabilized in a boot, and he will be out for the remainder of the season, writes Armando Salguero of the Miami Herald. LeSean McCoy‘s knee injury appears to be a minor MCL sprain, according to Rand Getlin of the NFL Network (via Twitter). He is expected to be listed day-to-day by the Bills. Marcus Mariota will have an MRI on Monday after injuring his knee against the Patriots, according to Pro Football Talk (via Twitter). The Titans believe he suffered an MCL injury. With Zach Mettenberger the only other passer on the roster, Tennessee will likely add a quarterback this week. Dolphins left tackle Branden Albert left the game with a knee injury, and Dallas Thomas was exploited replacing him, according to James Walker of ESPN (via Twitter). With Thomas struggling, the Dolphins will need to make a move if if they want to give any chance to Ryan Tannehill and the offense. Another big name left tackle went down with an injury in the Seahawks’ Russell Okung, who was doubtful to return with a calf injury, according to Bob Condotta of the Seattle Times (via Twitter). 49ers running back Shaun Draughn exited the game with a knee injury, according to Eric Branch (via Twitter). Draugn has been the leading ball-carrier for the 49ers the last five games after being acquired from Cleveland. With Carlos Hyde and Reggie Bush already out, the 49ers will have to dig deep on the roster to find a new starting running back. Linebacker Stephen Tulloch and the Lions’ defense have fared well since coordinator Teryl Austin decreased Tulloch’s role earlier in the season and started using him mostly as a run stopper. Despite the uptick in Tulloch’s play, his future beyond this season is uncertain. Because linebackers who have difficulty against the pass aren’t that valuable, the Lions could opt to cut the 10-year veteran after the season and save roughly $6MM on their cap, writes Kyle Meinke of MLive.com. Two of Tulloch’s biggest advocates – Austin and head coach Jim Caldwell – might be elsewhere in 2016, which would increase the likelihood of his days in Detroit ending. 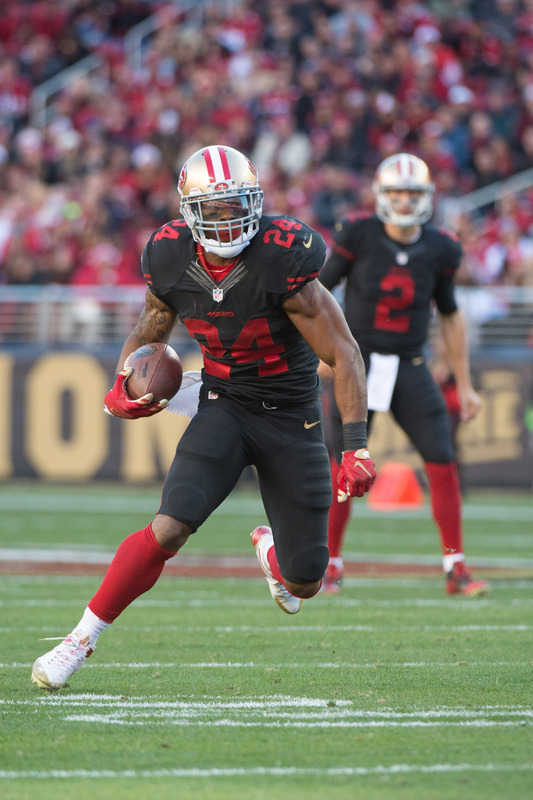 The 49ers plan to re-sign running back Shaun Draughn and let him compete for a roster spot next year, reports Matt Maiocco of CSNBayArea.com. Injuries to Carlos Hyde, Reggie Bush and Mike Davis have enabled Draughn to take over the starting role over the last several games. Draughn hasn’t exactly dazzled as a ball carrier (3.3 yards per rush) during his four weeks as the team’s primary back, but he has averaged a respectable 85.5 total yards per game. Maiocco cites Draughn’s well-rounded game – including his ability on special teams – as the reason to keep him in the fold.